In 1984, Sheen first described spreader grafts as a method of reconstructing the internal nasal valve and/or recontouring the aesthetic appearance of the nasal dorsum in cases of primary and secondary rhinoplasty. [1, 2] Originally, these grafts were placed in a submucoperichondrial pocket via the closed approach. However, evolution of open rhinoplasty technique has refined spreader graft placement and expanded indications for its use. The internal nasal valve exists within the middle nasal vault and is formed by the junction of the dorsal septum and the medial edge of the upper lateral cartilage. In addition to being the most resistive segment in the nasal airway, its constituent structures contribute to the contour of the middle nasal vault and nasal dorsal appearance. In many patients, the functional impairment or dorsal contour is different on each side of the nose, owing to asymmetry of the relationship between the upper lateral cartilage and the dorsal septum. The first is a patient with a congenital abnormality of this region. This is either from an inherently weak upper lateral cartilage or a congenitally crooked dorsal septal margin that deviates to one side. See the image below. This young female rhinoplasty patient presented with a crooked nose deformity. This was a result of congenital deviation of her dorsal septum to her left side. As noted diagrammatically, her bony nasal vault was quite straight (vertical blue line). 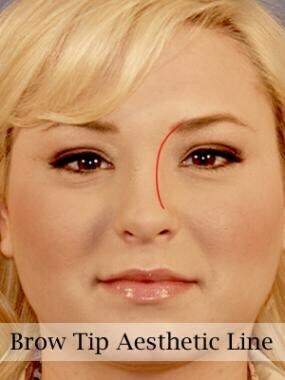 Her dorsal septum, however, was deviating toward the left side (angled red line), contributing to a crooked alignment. The second is a patient who has undergone prior reductive rhinoplasty that resulted in over-resection and destabilization of the dorsal septum and upper lateral cartilage. Rates of spreader graft placement by plastic and reconstructive surgeons are not known, although its use and application are becoming more widespread. In the resting state, the cartilage of the normal internal nasal valve does not collapse with inspiration. If the upper lateral cartilage is inherently weak or its position has been altered (surgically or from congenital deviation of the dorsal septum), the middle nasal vault may collapse at rest. With more forceful inspiration, further internal narrowing may be seen, along with worsening subjective nasal obstruction. Patients with internal nasal valve dysfunction present with unilateral or bilateral nasal obstruction. Examination may reveal an asymmetric brow-tip aesthetic line or pinched middle vault best seen on frontal view. 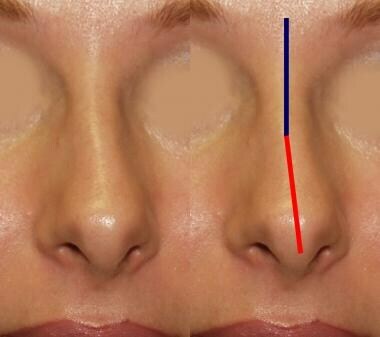 In some cases of prior reductive rhinoplasty, patients may present with an inverted V deformity. An inverted V deformity refers to the upside down V-shaped shadow that can be seen on frontal view of the nose. This reflects excess reduction of the bridge and subsequent collapse of the upper lateral cartilage below the junction of the bony nasal pyramid. A complete nasal examination must be performed to diagnose patients who require spreader graft placement. Patients should be examined before and after application of topical 1% phenylephrine to aid in identifying reversible mucosal edema. Consider other factors, such as septal deviations, inferior turbinate hypertrophy, and external nasal valve collapse, which may confuse or confound the diagnosis of internal valve dysfunction. Some patients may present without symptoms of nasal obstruction and may only have evidence of aesthetic asymmetry or an overly narrow middle nasal vault. Such abnormalities are diagnosed most readily on examining frontal views of the face with noticeable unilateral or bilateral disruption of the brow-tip aesthetic line. The dorsal nasal contour occasionally is described as hourglass with the narrowest portion through the middle vault. A visible demarcation and depression of the caudal margin of the bony nasal pyramid may also be confirmed on oblique views. When evaluating the internal valve region, performing the intranasal examination without use of a nasal speculum is best. 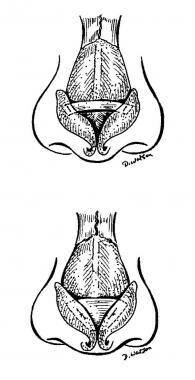 The speculum often distorts the native relationship of the septum and the caudal edge of the upper lateral cartilage and artificially opens the valve. Instead, the tip of the nose may be elevated gently using the examiner's finger with inspection and measurement of the internal valve region using a good light source. Nasal endoscopy is an alternative method of visualizing the nasal valve without distorting the native anatomic relationships. Sometimes trimming the nasal vibrissae is necessary to allow more optimal visualization. The typical angle between the dorsal septum and the upper lateral cartilage measures 10-15° in Caucasian noses. Some variation exists in this typical range with other ethnic groups. A smaller angle is believed to increase airflow resistance and be consistent with symptomatic narrowing of the valve. Dynamic assessment of the internal nasal valve is somewhat more of a challenge. Many patients who present with internal valve collapse have inherently weakened cartilage throughout the nasal framework. Therefore, internal valve dysfunction needs to be differentiated from external valve abnormalities. With inspiration, abnormal collapse may be observed in the middle or lower third of the nose or both. Dynamic narrowing within the middle third with inspiration indicates excessively compliant upper lateral cartilages and implies internal valve dysfunction. Excess narrowing of the lower one third and lower alar cartilages with inspiration implies external valve collapse. The Cottle maneuver is a classic technique used to diagnose an internal nasal valve disorder. While the patient inspires quietly, the cheek is pulled laterally, thus simulating widening the cross-sectional area of the internal nasal valve. If the patient notes an appreciable improvement in breathing with this maneuver, the Cottle sign is positive. This generally has been interpreted as an indication for spreader graft placement to improve the internal valve angle and nasal function. A false-positive Cottle sign sometimes may be observed in patients with alar collapse, with a false-negative result occasionally observed in patients with scarring in the valve region. Sheen originally described spreader grafts to target a dysfunctional internal nasal valve with or without middle vault asymmetry and narrowing. Conceptually, the grafts were intended to act as volumetric expanders in moving the upper lateral cartilage away from the dorsal septum to increase the valve angle and provide more width along the roof. Some patients may require insertion of spreader grafts yet have no history of prior nasal surgery. A certain segment of the population has inherently weak or flaccid upper lateral cartilage that collapses readily, even at rest. Other patients develop nasal obstruction secondary to the aging process, with relaxation of tissues leading to a flaccid internal valve. These patients are easily recognized as having narrow nose syndrome with visible collapse of the lateral nasal wall and excessive upper lateral cartilage movement with inspiration. In addition to reducing this type of collapse, spreader grafts aid in widening the nasal dorsum and reconstituting a more aesthetically pleasing appearance. Other patients present with no prior history of surgery but with a crooked nose deformity due to deviation of the cartilaginous dorsum. This is one of the most difficult problems in rhinoplasty and often presents a significant challenge to the reconstructive surgeon. To straighten the nose and correct the dorsal septal deflection, spreader grafts may be indicated unilaterally or bilaterally to correct the alignment. More commonly, patients who require spreader graft placement have a history of prior rhinoplasty surgery that has contributed in some manner to internal valve dysfunction, aesthetic abnormality, or both. Dorsal hump reduction is a fairly common maneuver used in reductive rhinoplasty surgery. This typically requires transection of the dorsal septal cartilage and the medial margin of the upper lateral cartilage to reduce the bridge height. Disruption of this natural T-shaped configuration can predispose to potential collapse of the middle vault and internal valve dysfunction. This is particularly true in patients with a short nasal pyramid because the bony vault already provides inadequate support for the relatively longer upper lateral cartilage. If the nasal valve region is not reconstructed or reinforced following this maneuver, nasal obstruction is likely to occur postoperatively. This is a phenomenon that is not likely to be appreciated in the early postoperative period. Instead, this usually manifests 6-12 months later as soft tissue swelling subsides and scar contracture evolves. Some patients have an adequate bony nasal vault in terms of length but have excessively thin skin. Following dorsal resection in this patient population, any shift or collapse of the upper lateral cartilage is more likely to be visualized. This usually manifests as unwanted contour irregularities or as a frank inverted V deformity. Patients with thicker skin have less of a tendency to ‘shrink wrap’ around the underlying cartilage and are, thus, less prone to visible contour abnormalities in this setting. During rhinoplasty, the surgeon should be aware of such anatomic variants with consideration of spreader graft placement to avoid postoperative internal valve dysfunction and/or aesthetic abnormalities. In addition, performing concurrent temporal fascia grafting over the spreader grafts should be considered in patients with thin skin. Such a maneuver further cushions and thickens the thin skin envelope and helps minimize development of the aforementioned contour irregularities. Middle vault abnormalities may also result from inadvertent avulsion of the upper lateral cartilage from the nasal bones secondary to improper rasping or aggressive out-fracturing. Disruption of this relationship may compromise the normal attachment of the upper lateral cartilage to the septum with impingement on valve function. This is commonly due to anatomic disruption of the cartilage as well as the underlying mucosal tissue. A composite skin-cartilage spreader graft has been described that anatomically corrects this combined mucosal scarring and cartilaginous collapse. See the image below. Diagram of composite spreader graft placement in between the upper lateral cartilage and dorsal septum. As noted, the composite graft includes cartilage and skin intended to replace the cartilage and mucosal lining that is deficient in the internal nasal valve segment. A variation of the spreader graft has also been used in more complex reconstructive nose surgeries to address both the internal valve and tip support in combination. Similar to other spreader grafts, these spreader septal extension grafts are placed between the dorsal septum and the medial edge of the upper lateral cartilage. However, with this technique, the spreader graft is fashioned to extend into the tip-lobule complex to help alter tip position and definition. In this manner, the dorsal septum is strengthened and straightened, internal valve collapse is addressed, and tip projection is improved with this variant of the spreader graft. Gunter and Rohrich have described a different type of spreader graft that has been used as an alternative technique in management of the pinched nasal tip deformity. This deformity reflects loss of lateral support and collapse of the lateral crura most commonly due to acquired causes. In this setting, the graft is fashioned into either a bar-shaped or triangular-shaped segment to lateralize the lower alar cartilages. Because of this, the terms "lateral crural spanning grafts" and "interpositional grafts" have been used to describe this particular technique. See the image below. Diagram of spreader graft variation used to correct a pinched nasal tip. The graft is shaped as either a rectangle or triangle and placed in between the lower lateral cartilages to widen the tip contour and shape. The goal of this type of graft is to spread the lateral crura sufficiently to correct the alar collapse but not so much as to detract from desirable aesthetic proportions. More improvement is noted in function with wider grafts. However, this needs to be balanced in light of greater nostril flare with more robust graft size. The authors also note possible improvement in internal valve collapse using this type of spreader graft. In secondary rhinoplasty in which cephalic margin resection was performed previously, a band of scar tissue develops between the caudal end of the upper lateral cartilage and the cut edge of the lower lateral cartilage. If this scar tissue is left intact during revision surgery, this type of spreader graft simultaneously pushes the lateral crura outward while pulling the caudal end of the upper lateral cartilage laterally. As evidenced by this discussion, previous rhinoplasty is a common cause of internal valve collapse. As such, the best strategy is prevention of unintentional changes to the middle nasal vault during the primary surgery. When performed correctly with concern for the integrity of the internal nasal valve and skin envelope, primary rhinoplasty can be done while minimizing chances of a dysfunctional airway and aesthetic abnormalities. Before discussing the indications for spreader graft placement, a good understanding of the relevant anatomy in this region is critical. The internal nasal valve plays a key role in regulating the flow of air through the nasal passages. It also has been referred to as the limen vestibuli, the liminal valve, and the os internum. 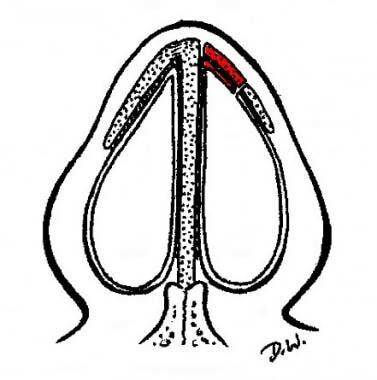 Sitting within the middle nasal vault, the internal nasal valve is formed by the junction of the dorsal septum and the medial edge of the upper lateral cartilage. Relevant structures bordering the valve region include the anterior margin of the inferior turbinate, the pyriform aperture, and the nasal floor. The medial edge of the upper lateral cartilage articulates with the anterolateral extension of the dorsal septum to make a T-shaped configuration. This attachment of the medial edge of the upper lateral cartilage to the septum normally forms an angle of approximately 10-15°. This angle is considered the apex of the internal valve and, as the narrowest region of the nasal airway, acts as the predominant resistive segment. Reportedly, changes in the nasal valve of as little as 1 mm may result in significantly improved nasal valve function. The nasal passage and internal nasal valve can be viewed conceptually as a Starling resistor with a flow-limiting segment. In the resting state, normal cartilage of the internal nasal valve does not collapse inward with inspiration. As air passes through this constricted region, airflow is accelerated. According to the Bernoulli principle, as this airflow increases, the lateral pressure decreases. If the area of constriction is abnormally compliant, as with weakened or malpositioned upper lateral cartilages, more forceful inspiration leads to internal collapse and further narrowing with a sensation of obstruction. In addition to being critically involved in physiologic nasal airway function, the structural components of the internal nasal valve contribute significantly to the external appearance of the nose. The aesthetic contour of the nasal dorsum is influenced greatly by the relative position of the underlying upper lateral cartilages as they articulate with the dorsal septum. This important relationship contributes significantly to the brow-tip aesthetic line as seen on frontal view of the nose. When this relationship is disturbed, the normally continuous brow-tip aesthetic line is disrupted and manifests as an asymmetric and/or pinched middle vault. As noted previously, more severe degrees of disruption resulting from surgical manipulation often lead to the appearance of an inverted V deformity. See the image below. Brow-tip aesthetic line with significant contribution made by the middle vault region. Spreader grafts may be contraindicated in patients who already demonstrate borderline or excess middle vault width. If functional repair is a higher priority than aesthetic appearance, inform patients with widened middle vaults that improved function may be accompanied by further widening. Spreader graft placement also should be avoided in certain revision rhinoplasty cases in which spreader grafts are being used strictly for aesthetic refinement. Dense scarring and previous cartilage excision often complicate surgery of the middle nasal vault in revision rhinoplasty. In these instances, avoiding further manipulation of the middle vault and, instead, opting for dorsal onlay augmentation may be more prudent. Samaha M, Rassouli A. Spreader graft placement in endonasal rhinoplasty: Technique and a review of 100 cases. Plast Surg (Oakv). 2015 Winter. 23 (4):252-4. [Medline]. [Full Text]. Guyuron B, Michelow BJ, Englebardt C. Upper lateral splay graft. Plast Reconstr Surg. 1998 Nov. 102(6):2169-77. [Medline]. Santiago-Diez de Bonilla J, McCaffrey TV, Kern EB, Kern EB. The nasal valve: a rhinomanometric evaluation of maximum nasal inspiratory flow and pressure curves. Ann Otol Rhinol Laryngol. 1986 May-Jun. 95(3 Pt 1):229-32. [Medline]. Heinberg CE, Kern EB. The Cottle sign: an aid in the physical diagnosis of nasal airflow disturbances. Rhinology. 1973. 11:89-94. Gunter JP, Rohrich RJ. Correction of the pinched nasal tip with alar spreader grafts. Plast Reconstr Surg. 1992 Nov. 90(5):821-9. [Medline]. Erickson B, Hurowitz R, Jeffery C, et al. Acoustic rhinometry and video endoscopic scoring to evaluate postoperative outcomes in endonasal spreader graft surgery with septoplasty and turbinoplasty for nasal valve collapse. J Otolaryngol Head Neck Surg. 2016 Jan 12. 45:2. [Medline]. [Full Text]. Stal S, Hollier L. The use of resorbable spacers for nasal spreader grafts. Plast Reconstr Surg. 2000 Sep. 106(4):922-8; discussion 929-31. [Medline]. Mendelsohn M. Straightening the crooked middle third of the nose: using porous polyethylene extended spreader grafts. Arch Facial Plast Surg. 2005 Mar-Apr. 7(2):74-80. [Medline]. Kim YH, Jang TY. Porous high-density polyethylene in functional rhinoplasty: excellent long-term aesthetic results and safety. Can J Plast Surg. 2014 Spring. 22(1):14-7. [Medline]. Mohammadi S, Mohseni M, Eslami M, Arabzadeh H, Eslami M. Use of porous high-density polyethylene grafts in open rhinoplasty: no infectious complication seen in spreader and dorsal grafts. Head Face Med. 2014 Dec 22. 10:52. [Medline]. [Full Text]. Teymoortash A, Fasunla JA, Sazgar AA. The value of spreader grafts in rhinoplasty: a critical review. Eur Arch Otorhinolaryngol. 2011 Nov 19. [Medline]. de Pochat VD, Alonso N, Mendes RR, Cunha MS, Menezes JV. Nasal patency after open rhinoplasty with spreader grafts. J Plast Reconstr Aesthet Surg. 2011 Dec 22. [Medline]. Xavier R, Azeredo-Lopes S, Papoila A. Spreader grafts: functional or just aesthetical?. Rhinology. 2015 Dec. 53 (4):332-9. [Medline]. Jalali MM. Comparison of effects of spreader grafts and flaring sutures on nasal airway resistance in rhinoplasty. Eur Arch Otorhinolaryngol. 2015 Sep. 272 (9):2299-303. [Medline]. Mamanov M, Batioglu-Karaaltin A, Inci E, Erdur ZB. Effect of Spreader Graft on Nasal Functions in Septorhinoplasty Surgery. J Craniofac Surg. 2017 Oct. 28 (7):e618-21. [Medline]. Example of explanted septal cartilage to be used for grafting purposes. Notice ample amount of cartilage material that can be harvested during a primary case. Cartilage is usually sufficient to fashion 2 equivalent-sized spreader grafts (see black arrow) as well as tip and batten grafts, if necessary. Example of surgical exposure of middle vault region in preparation for spreader graft placement. Notice separation of the medial edge of the upper lateral cartilage from the dorsal septum margin. Also note how crooked the dorsal septum is in this patient. The primary indication for placement of the spreader grafts in this patient was to achieve more bridge symmetry. Diagram of spreader graft placement with use of horizontal mattress sutures for secure positioning. This is an example of spreader graft placement for a crooked nose deformity. This patient had a high dorsal deflection (crooked dorsal septum) that was causing the lower aspect of her nose to deviate to her left side. A spreader graft was placed to splint the dorsal septum into a straighter position, thus creating more symmetry, as seen on her postoperative frontal view. This intraoperative photo demonstrates proper placement of the spreader graft in cases of a high septal deflection. The blue arrows correspond to the medial margin of the upper lateral cartilage, which has been separated from the dorsal septum. The yellow arrow corresponds to the spreader graft placed on the left side (green arrow), helping to splint the concave side of the deviated septum.